NVIDIA Home > Support Home Page > Knowledgebase Home Page > How do I remove My Rig Details overlay from Share in GeForce Experience? Scripting must be enabled to use this site. How do I remove My Rig Details overlay from Share in GeForce Experience? 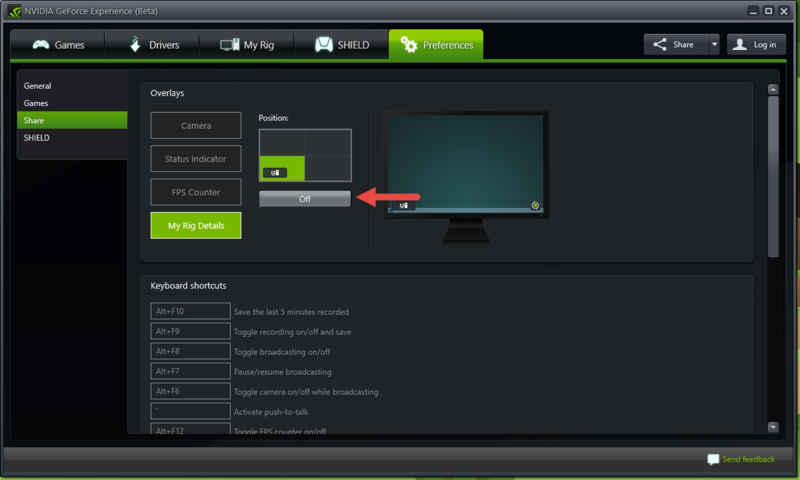 Open the Preferences tab -> click on Share from the left panel -> click the My Rig Details button on the right -> select Off to disable the overlay from your Share videos. To re-enable the overlay, go back to this screen and click on the quadrant where you would like the My Rig Details overlay to appear. Your rating has been submitted, please tell us how we can make this answer more useful. I can't enable GeForce Experience Share video game recording feature. How do I fix this problem? Which GeForce GPUs support GeForce Experience Share to record gameplay?